This old french dip crock pot dinner recipe is one of my favorite slow cooker recipes, and also, crazy enough, one of my most popular, too! It’s been pinned and tried by over 80,000 people on Pinterest! It’s September here in Iowa, but you wouldn’t know it by the 89 degree day and the howling wind … but for reals.. hold on ‘ol man winter – you’re only welcome here come January. 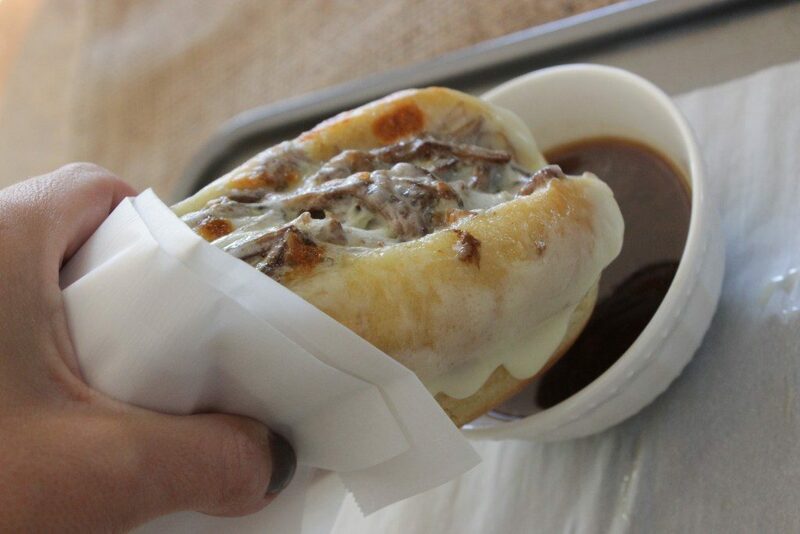 But, who needs winter weather for a good crock pot french dip? Not this lady, that’s for sure. The trusty crock pot is a staple in our house all year long, as it’s the path of least resistance to keeping days sane and holding back grey hairs from continuing to pop in too prematurely. 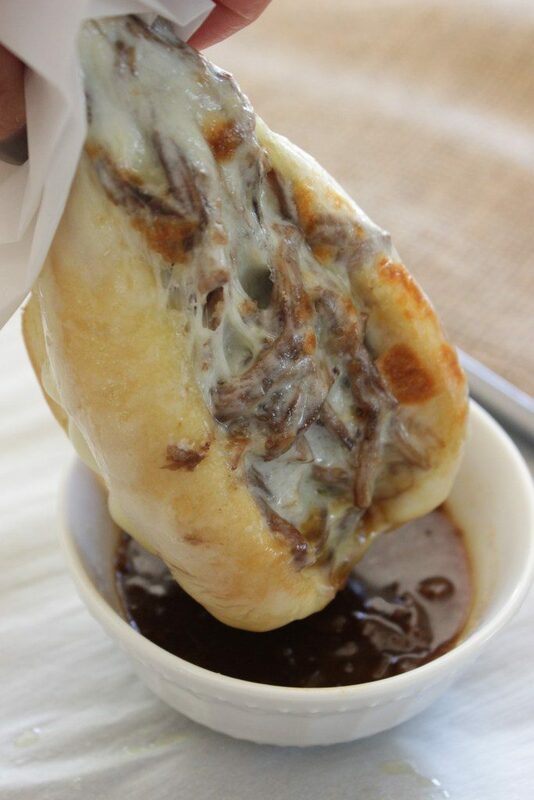 Anyhow, every time I make this slow cooker french dip sandwich recipe my family loves it — yes, even the kids, which isn’t always the case, as you’d probably guess. 🙂 And, of course it’s about as easy as slow cooker recipes come, so if you’re planning on having a busy week, this is the meal to count on. I promise you’ll get no gripes, only full tummies. And, serve it with some french fries and you’re golden, even better, right?! 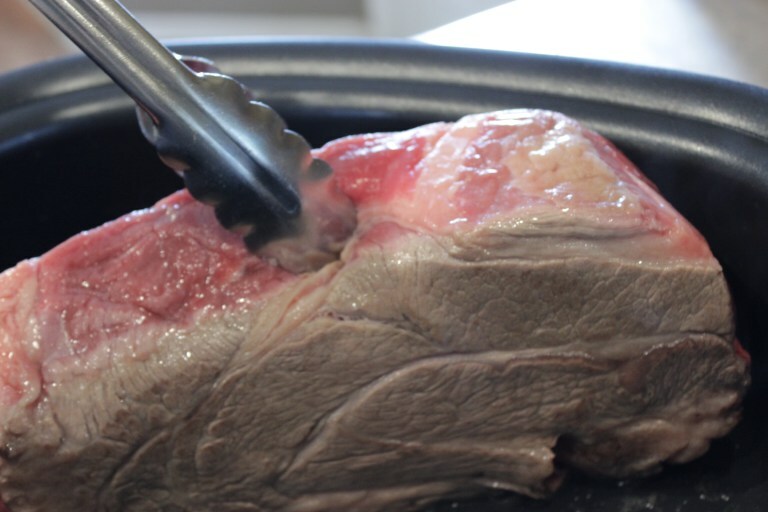 You’ll want to start with a big ‘ol chuck roast. Besides a steak on the grill, this has to be my favorite cut of beef. I’ve got a thing for roasts … seriously yummy. Using a pan brown both sides in some vegetable oil. I HIGHLY recommend the Ninja 3 in 1 slow cooker, because in this you can brown meat, slow cook meat and even steam things. 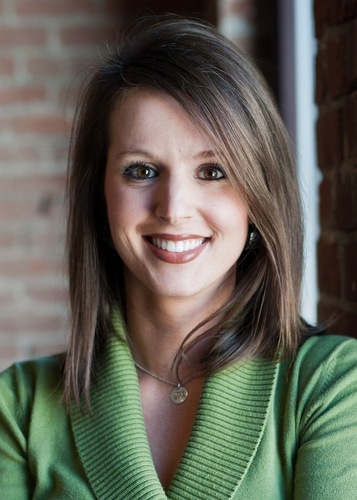 It is a huge timesaver and I absolutely love mine! And, it’s on sale right now so now’s that time to grab it if you’re interested. When I make these french dips in the crock pot I serve them with Ore Ida french fries – delicious! Another great side dish would be these crockpot cheesy potatoes or how about this Cheesy Potato Casserole? Any of these will compliment this easy crock pot dinner well! Before I made my slow cooker french dip sandwiches this way, I would just buy the roast beef from the deli counter and the little packet of Aus Jus dry mix that you mix with water. 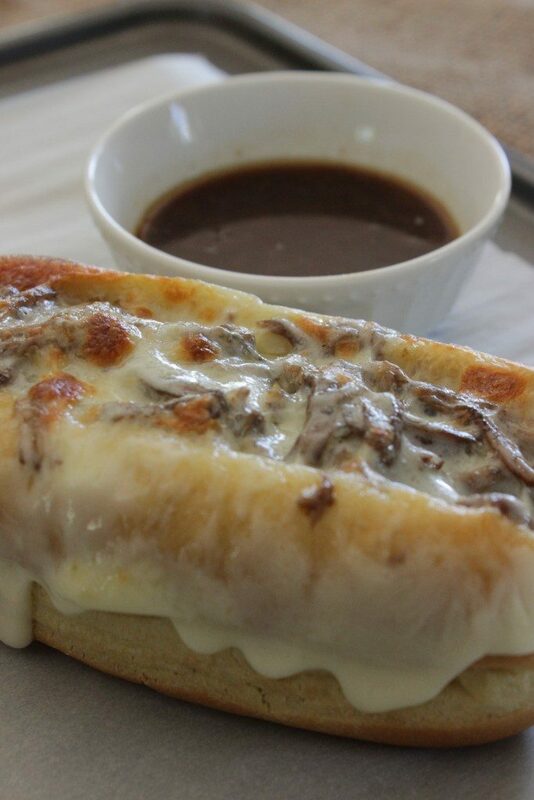 Pull the roast beef out of the french dip au jus sauce, pile that on a hoagie bun and proceed like my slow cooker french dip says to by putting a couple slices of provolone cheese on top and setting the filled hoagie buns under the broiler for a few minutes. And, it served it’s purpose and got me where I needed to be, but I tell you what … these slow cooker french dip sandwiches are so much better than what those were… SO much better!